It’s getting warmer this week. On Sunday the top UK temps didn’t even reach 12C, on Monday, yesterday, there was 13 to 15C recorded and by Easter weekend temperatures in the low twenties are expected with plenty of sunshine. 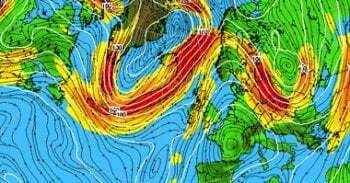 It’s been windy, thanks to the UK begin stuck in-between the steady static large high pressure over Scandinavia and a low pressure squeezing past western Ireland on Monday, now near to Iceland. 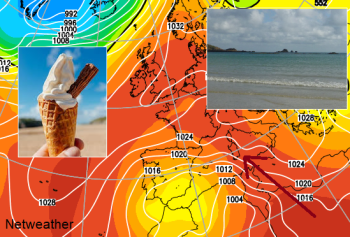 An easterly flow around the low pressure has kept the UK quite cool recently but as the synoptic situation shifts this week warmer air from the Mediterranean and Africa is pulled our way. The frontal band is still bringing rain, you can see the line on the radar from western Scotland, over Northern Ireland and the Irish Sea down to Dorset. It is giving some moderate bursts this morning, so grey, wet and a rather miserable start. This band edges slowly northeast, across Wales, away from Northern Ireland and into western mainland Scotland. Across central/southern England it becomes more showery with some hefty bursts, but these will be more scattered. Sunny spells are most likely for eastern and NE Britain, and this afternoon for Devon and Cornwall as the frontal cloud clears away. 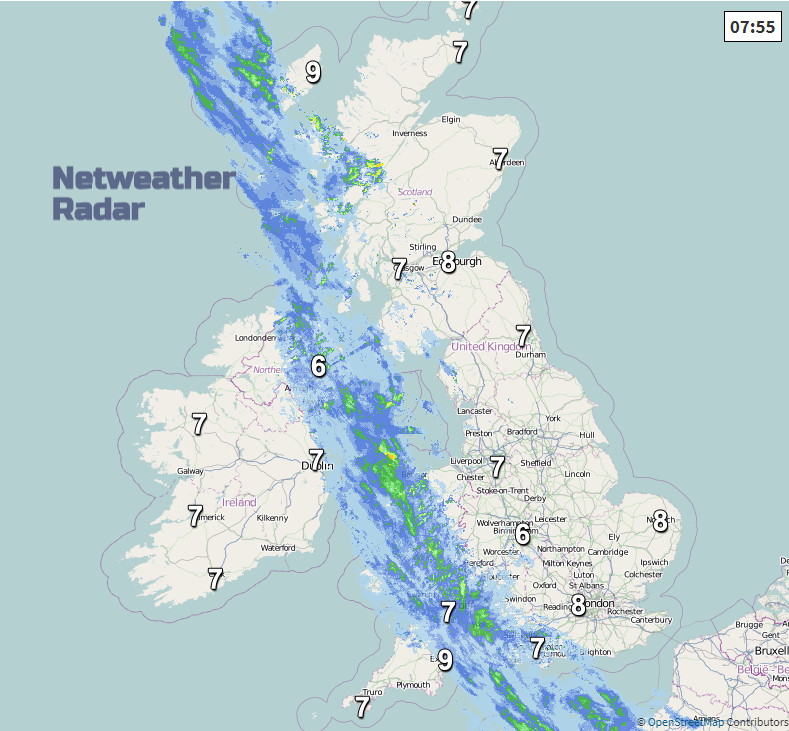 Away from the rain band many places will have a fair even bright day with temperatures of 10 to 17C. As the front continues to fade this evening, it leaves pockets of patchy lighter rain. 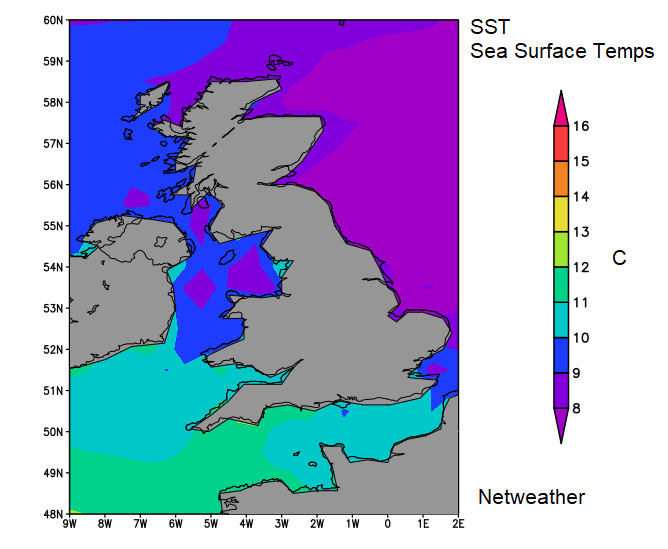 Western Scotland stays damp and around the Irish Sea. It will be cool overnight with lighter winds and mist and fog will form, with quite a grey murky start for eastern and central England. It will feel different by the middle of the week, the warmer air beginning to arrive. 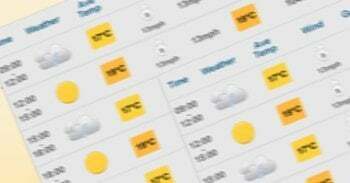 It will be dry, bright and temperatures will rise into the mid to high teens. Winds will be light but still from the east. So Merseyside and Manchester will be warm but Belfast stays cool. It will be a fine day with sunshine, just some low cloud off the North Sea again. It still turns chilly by night, under the clearer skies, so remember this is still April. There will be much more sunshine for Friday and Saturday, although a frontal band edges into the far NW later in the day. 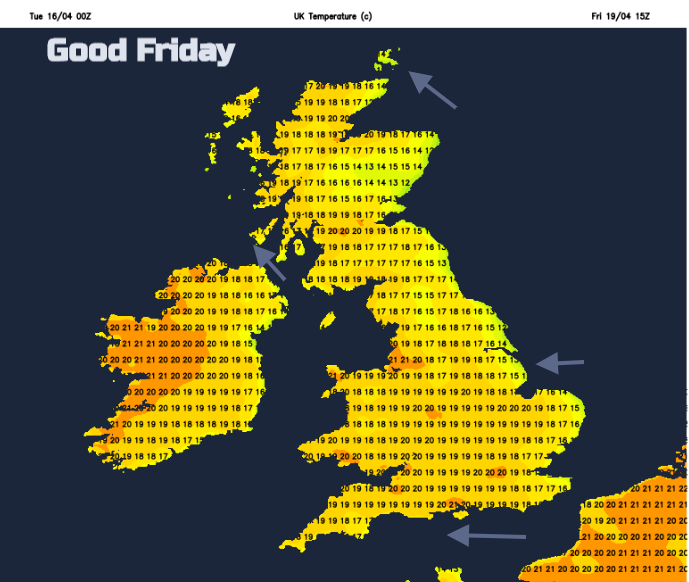 Overall the High pressure is holding strong and brings a lot of fine, warm, calm and sunny weather across the UK for the start of the long Easter weekend. Temperatures of 20 to 23C are expected, they could go a little higher, that's into the 70s Fahrenheit. Things begin to change from the north. 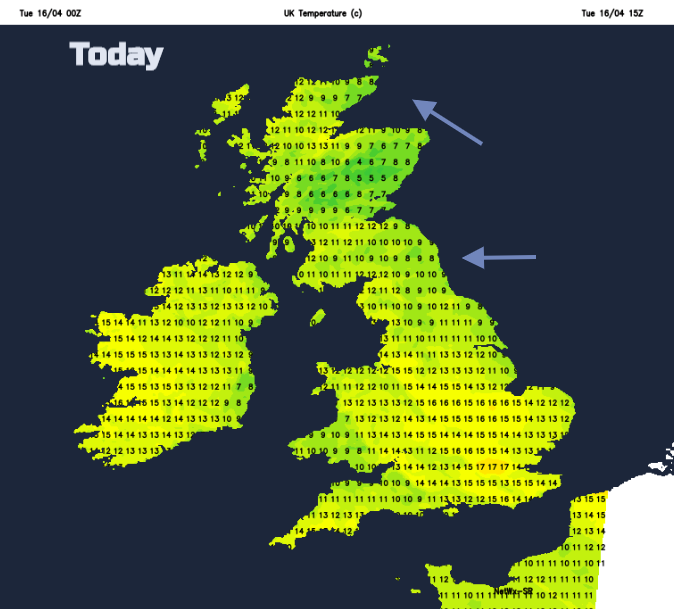 For England and Wales, Sunday still looks fine and warm, another super day. 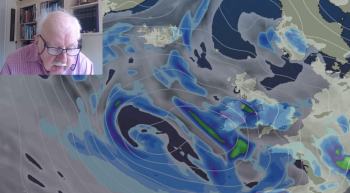 For Scotland and Northern Ireland, there could be more cloud and patchy rain edging down, but there is uncertainty about this and it could still be held at bay. 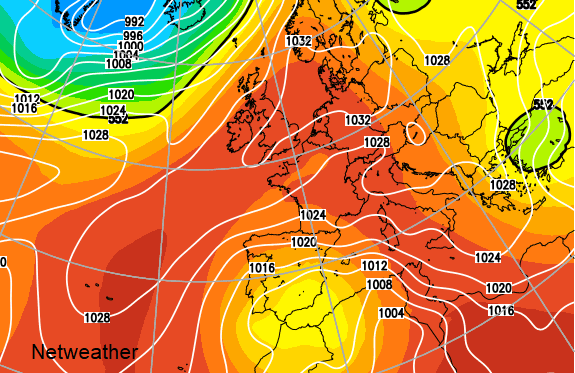 Easter Monday has similar changes, more for Ireland as another front edges in from the Atlantic will cooler air. 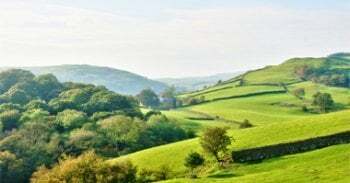 For much of Britain, it still looks like another dry and sunny day. 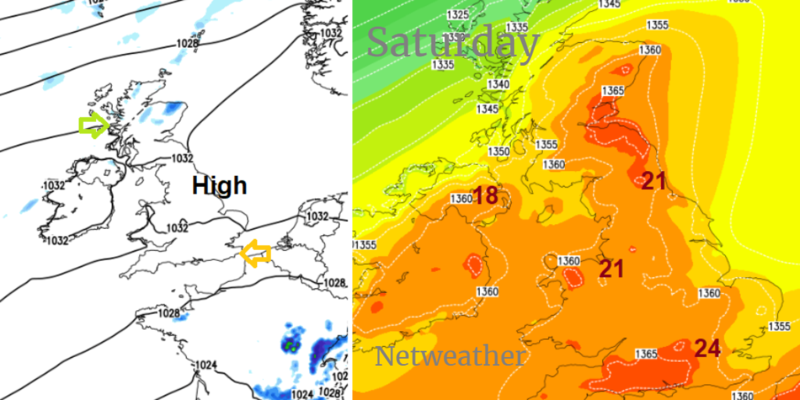 Overall this Easter weekend break does look warm, dry and sunny with light winds and temperatures into the high teens, low twenties. 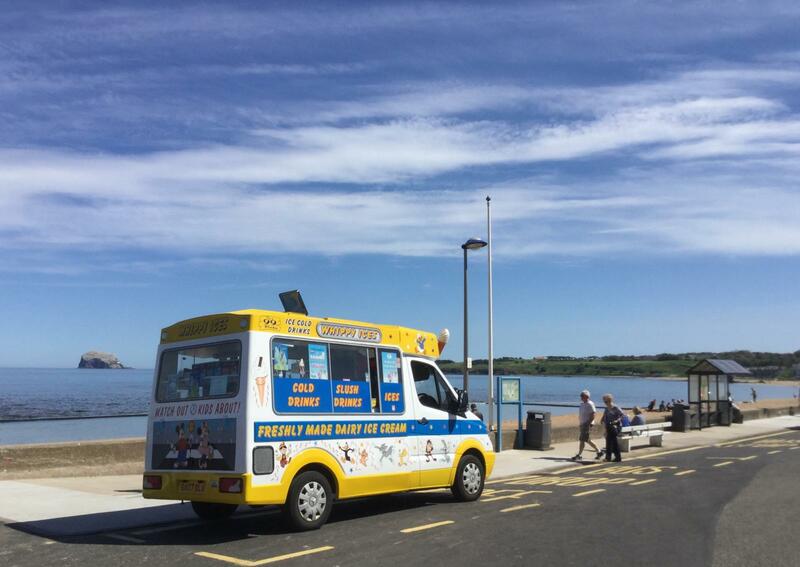 There is the chance of a change in the weather for Scotland and Northern Ireland during the second half of the long weekend, just something to keep an eye on.